The PL-8101 Double Bowl Undermount Stainless Steel Kitchen Sink is perfect for any kitchen. This double bowl sink is made with high-quality stainless steel. Made for style and convenience, this kitchen sink has it all. Keep it classy with a beautiful satin finish. 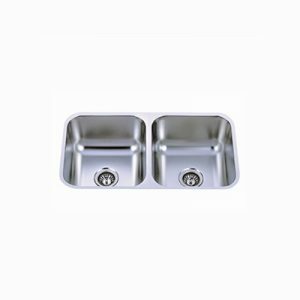 Whether you’re looking for the perfect kitchen sink for a new kitchen or you’re looking for a replacement for your old sink, there’s no better option than this stainless double sink from Fiberpol. This sink was made with 304 Grade stainless steel, and it’s the perfect size for any need. The undermount design makes it the perfect fit in a variety of kitchens, and it’s available through Fiberpol for an affordable price. Order yours today!